What Are The Nutritional Recipes To Increase Fast And Leaner Muscle For Newbies? 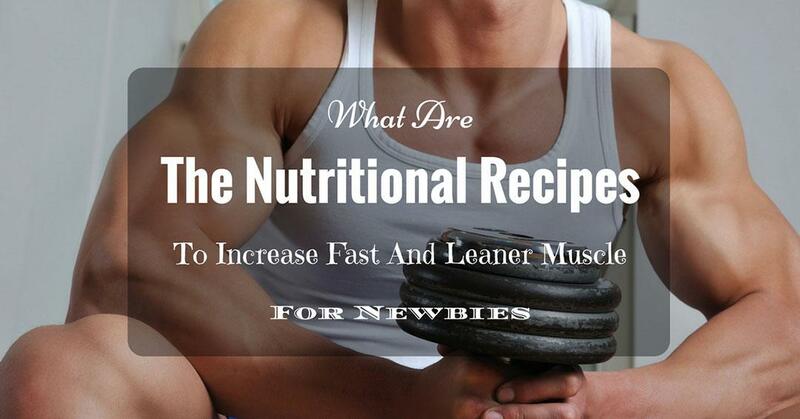 →What Are The Nutritional Recipes To Increase Fast And Leaner Muscle For Newbies? Eating several times is recommended when you’re bulking. By eating more often you will have a constant supply of fuel throughout the day for your muscles to grow. You will also make the most of your body’s metabolic cycle and keep fat levels down in your body. Six to eight meals is a good number, but timing is important. 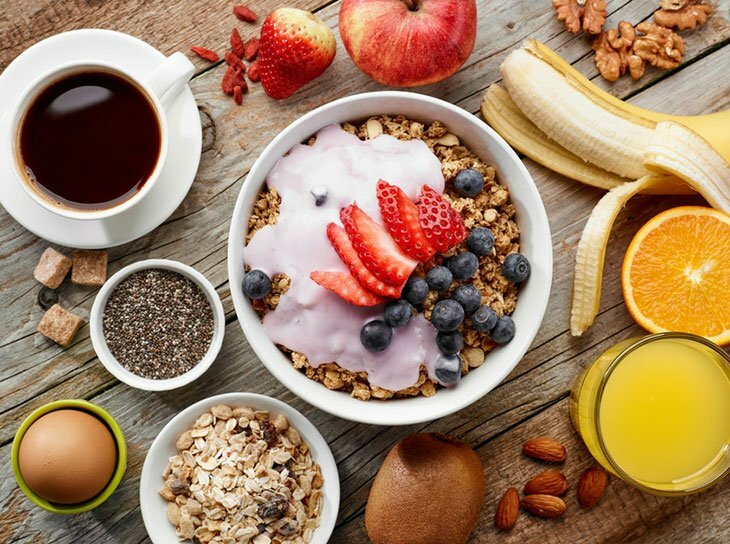 Feed your muscles when it needs calories the most: Have a bigger meal for breakfast, since your body has used up nutrients overnight from last evening’s meal Eat big after training, since your muscles need nutrients for recovery. How Many Calories And Proteins Can You Eat Each Day? How you divide the rest of your calorie requirements is up to you. Keep the other meals small and evenly divided across the rest of the day. Stir-fry the mushrooms in a spray of extra virgin olive oil for around 2 to 3 minutes over high heat until the mushroom is lightly golden. Stir-fry the diced chicken breast in the same way for a few minutes longer until cooked. 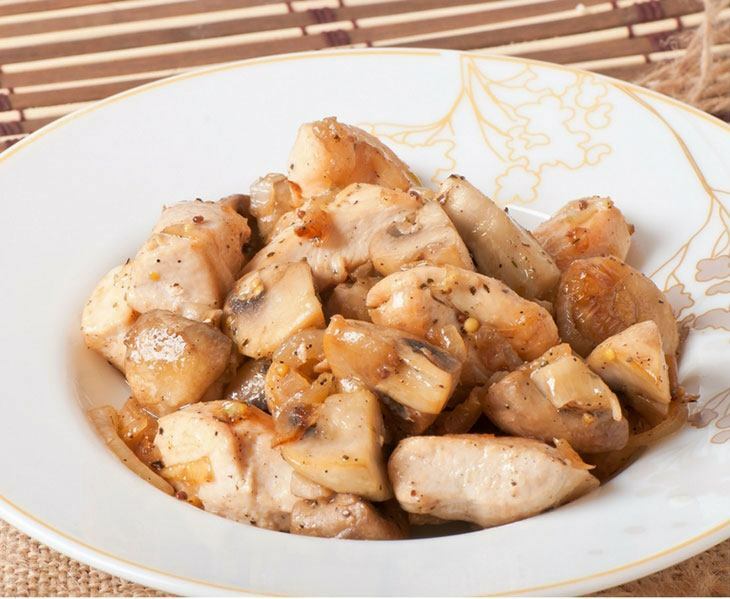 Add the mushrooms and chicken to a bowl with chopped green onions and cheese. Beat the eggs in a bowl and then swirl the eggs into the pan (adding more cooking spray if required). When the omelet starts to set, spoon the stuffing on one half and fold the other half over with a spatula. Cook for a few more minutes. Enjoy your omelet with half a cup of mixed berries. You can add some fish oil supplement as well. One egg white contains about 3 grams of protein, including 2.18 grams of BCAA (branched chain amino acids). These amino acids like valine, leucine, and isoleucine are absolutely necessary for muscle building. Sadly, our body can’t produce these amino acids, and eggs have all 9. This makes eggs excellent bulking food. 3 ounces of chicken breast contains about 18 grams of protein with 6.6 grams of BCAA, especially leucine, which is the primary muscle-builder. Mushroom is rich in potassium, fiber, vitamin C, selenium, copper, phosphorus and iron among other things; dietary fiber keeps you full for longer. So it’s great for keeping fat away while you bulk. It also contains choline, which helps to maintain the structure of cell membranes. Green onions taste great, and they provide lots of vitamins and minerals, as well as dietary fiber. The cheese provides flavor and calcium, and can be used to make up your fat requirements. The fish oil supplement will add good fats. The berries give you a sweet, vitamin-rich boost of energy from carbs. Avoid egg yolks and stick with only egg whites (though keep in mind you’ll lose half the protein of an egg by cutting out the egg yolk). Replace the low-fat cheese with low-fat yogurt for lower calories. You can learn on how to make yogurt at home here. Boil the eggs and eat two of them whole and just the whites of four to six other eggs. Prepare the Cream of Wheat cereal in 16 ounces of water. Each egg contains about 85 calories. The yolks contain half the egg’s protein content, so it’s highly recommended that you have at least 2, unless you’re trying to lose a lot of weight or are watching your cholesterol intake. Eggs are also versatile – you can turn them into a frittata with some pepper, salt and chopped asparagus, scramble them, or have them fried in a light spray of extra virgin olive oil. The cereal provides a boost of slow-release energy, which will keep your muscles supplied with energy for several hours until your next meal. You can make the cereal more powerful by preparing it in 16 oz of low-fat milk. This will add 24 grams of carbs, 16 grams of protein and 4 grams of fat to your meal. The banana is a carb-rich source of slow-burning energy that will keep your muscles supplied. You can replace the banana with one cup of berries to shed around 50 calories, depending on your maintenance and plans. Boil your pasta in a pan of water with a handful of salt. In a non-stick ﻿skillet, brown the beef in a spray of extra virgin olive oi﻿l on a high-medium setting, until the beef is golden-brown. This should take about 5 to 8 minutes. Then lower the heat to medium, add a clove of garlic (chopped), half a dice onion, half a red pepper, sliced and a few sprigs of chopped thyme. Let the veggies brown for around 5 minutes more. Add a little water to the pan, reduce to low heat, season with salt and pepper and cover for around ten minutes while the pasta cooks. Cook the pasta al dente at this point. Add the broccoli florets to the pasta and cook for 2 minutes more. When the pasta is firm to bite and the broccoli is done, drain, and add into the skillet with the beef mixture. Enjoy. The beef will offer lean protein, with plenty of BCAA especially creatine. It is also rich in B vitamins and iron (which helps in producing energy). Pasta is of course a good source of carbs. Broccoli is an excellent source of dietary fiber, which is good for fat control, besides containing other excellent minerals and vitamins. 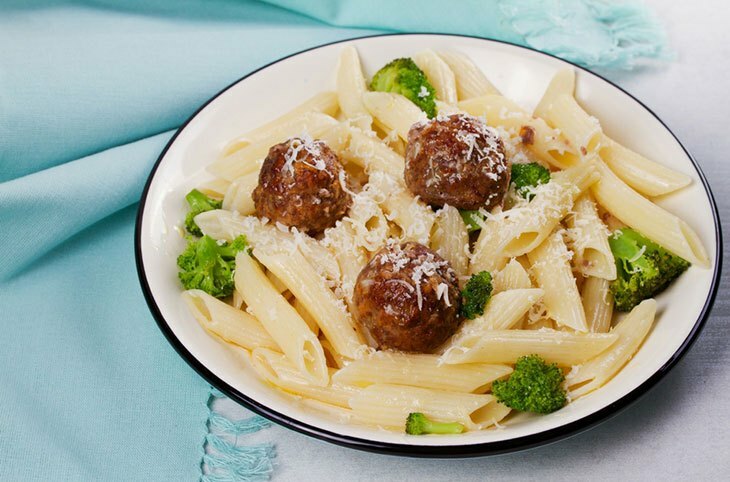 Eat half the pasta and double the broccoli for high fiber and low calories. 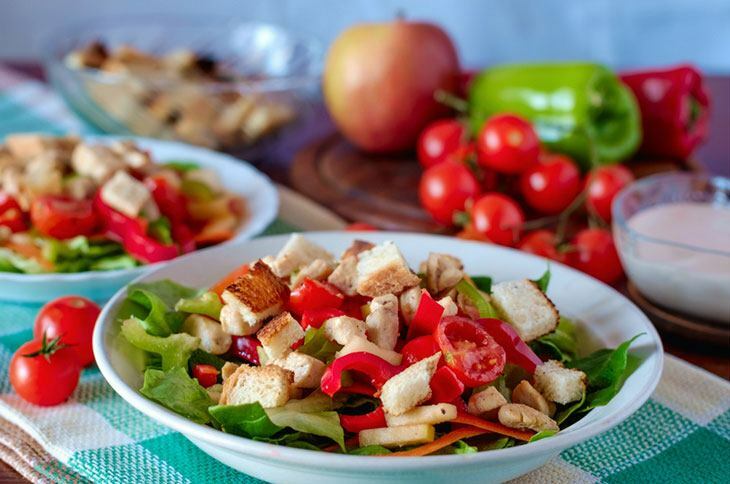 Make a crunchy and tasty salad of the ingredients on this list. It is quick to whip up and packed with proteins from the chicken and good carbs from the apples. It’s also easy to carry with you as a packed lunch. The chicken provides proteins, of course. The apples provide energy from the sugars without causing an insulin spike or fat storage. In addition, it contains dietary fiber that will keep you fuller for longer. It is also vitamin rich. Onions and peppers aren’t directly linked to muscle-building, but they spice up your plate. In addition, peppers and jalapes contain capsaicin, which is thermogenic. What this means is, it raises your body temperature and helps burn calories. Gril﻿﻿l the ﻿chicken breast at your outdoor grill or on a grill pan. Roast the yam or boil it. Boil the carrots, peas and corn. This flavorful and nutritious combination of lean protein and carbs will increase your blood insulin. This is great for growing your muscles as you’ll be supplying your muscles with nutrients that it needs for growth. The yam is good fat which burns slowly. 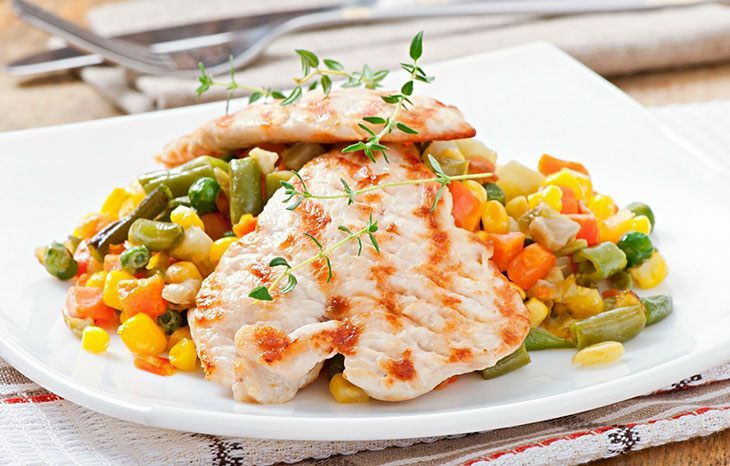 You can sauté the chicken in some extra virgin olive oil to add some essential fats into your meal. You can also add a glass of low-fat milk for additional protein, if you want to bulk up quickly. Replace the carb-rich veggies with something like green beans and eat only half the yam. Cook quinoa for 15 minutes. Next, grill the salmon with the skin on top, either on a BBQ grill plate or in a frying pan on your stove. Cook for 3 minutes, then flip over and cook the other side for another minute or two. Steam the broccolini and asparagus. Enjoy with yoghurt, capers and a squeeze of lemon on the steak. Salmon is rich in proteins. A single steak weighing 200 grams contains 39 grams of proteins. It is rich in fats, but these are good fats. 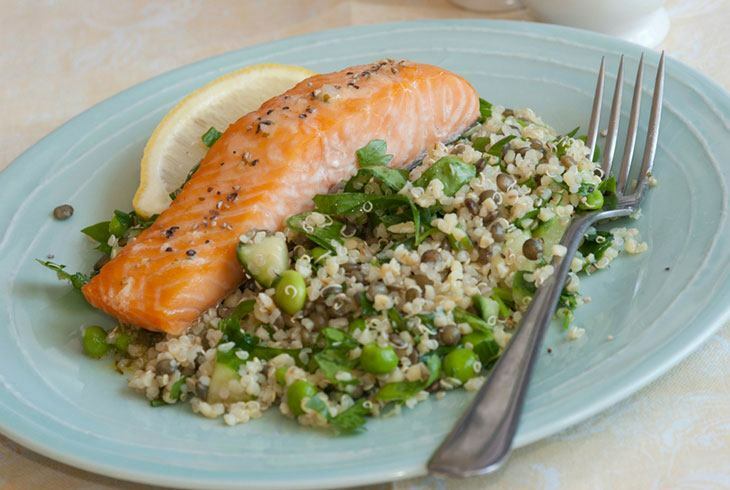 Quinoa is rich in fibers and very rich in proteins. It is one of the few plant foods that contain all the nine essential amino acids. It’s also rich in vitamins and minerals. You can learn some Salmon recipes by reading this article and Salmon head recipes. Asparagus contains substances that boosts metabolism by helping insulin carry glucose to the cells. This will further help you bulk quickly without gaining fats. Broccolini is rich in fiber, folate and minerals. Snacks in between larger meals will help to keep your muscles supplied with energy and protein at all time. In other words, you will be burning fats and building muscle throughout the day with these meal suggestions. Eating good carbs that burn down quickly, like a protein-rich sports drink, a baked potato or sugary fruit like pineapples, is recommended. This will quickly digest to release energy, which will be stored as glycogen to prepare you for the next day’s exercise. One scoop protein powder (17 g proteins) mixed in 1 cup reduced-fat Greek yoghurt (147 calorie, 27 g protein) and topped with a handful of shaved almonds, plus 1 cup berries OR 1 cup low fat cottage cheese (203 calories, 39 from fat, 31 g protein) with 2 to 3 tbsp peanut butter (188 calories, 6 g carbs, 8 g proteins in 2 tbsps) and 1-3 grams of a protein supplement like HMB. These recipes and snack ideas can be used as is, or you can use them as a starting point for planning your own meal plans. Play around with the ingredients to spice things up a little, or stick to the same meal plan every day. Whatever works for you. If you follow the math that I’ve explained in the beginning, you should see results pretty soon. Maybe in as early as a month. Stick with your routine and there’s no reason you won’t be bursting with energy and turning heads at the beach faster than you can say bulk. Eat around 300 to 600 more calories than you burn (or your maintenance level) on weight-training days. But not so much that your body begins converting the excess into fat. Do you see the delicate balance that you must achieve? Calculate calorie maintenance level by multiplying your body weight in pounds by 14 and then by 17. Your maintenance level will lie in between these two results. Active men, or men who think they have a fast metabolism, should err on the higher side. You can meet the surplus with a combination of 20 percent fat and 80 percent carbs. If energy is the catalyst, protein is the building block. Proteins go into building muscle tissue. It’s generally recommended that you take between 1.1 gram and 1.4 grams of protein for every pound of lean body mass. In particular, leucine, isoleucine and L-glutamine are the ingredients you should look for in protein-rich foods. Stick to eating your maintenance calories. Your protein levels should be the same every single day. On off-days, your muscles will need protein for recovery. This is how you maintain a toned body even when you’re not working out.